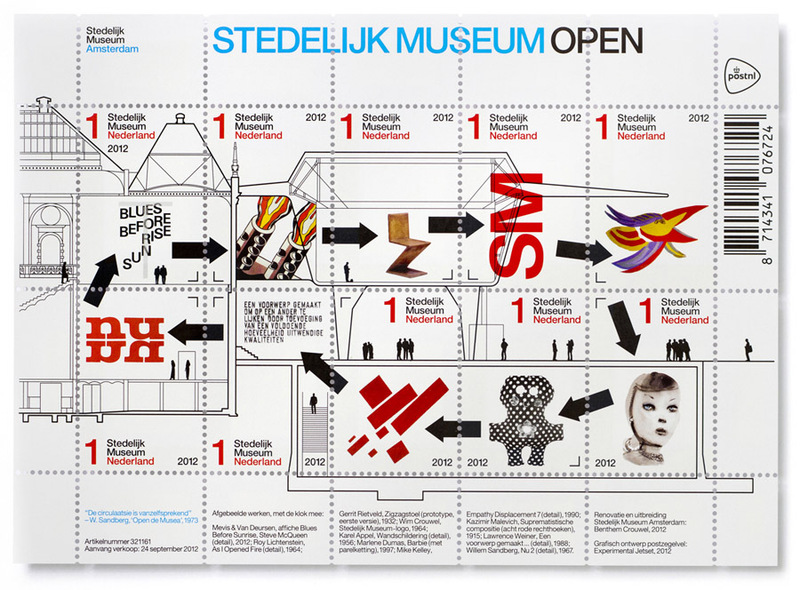 We were asked by Stedelijk Museum Amsterdam and PostNL (Dutch Mail) to design a sheet of stamps to celebrate the re-opening of the Stedelijk Museum, an event taking place in September 2012. Both these institutes (SM and PostNL) have played a significant role, not only in the graphic landscape of The Netherlands, but also in the development of our own design practice; so needless to say, we were thrilled to be asked for this project. The question consisted of two parts. On the one hand, we were specifically asked to focus on the new extension of the museum – the new wing, constructed alongside the original building. 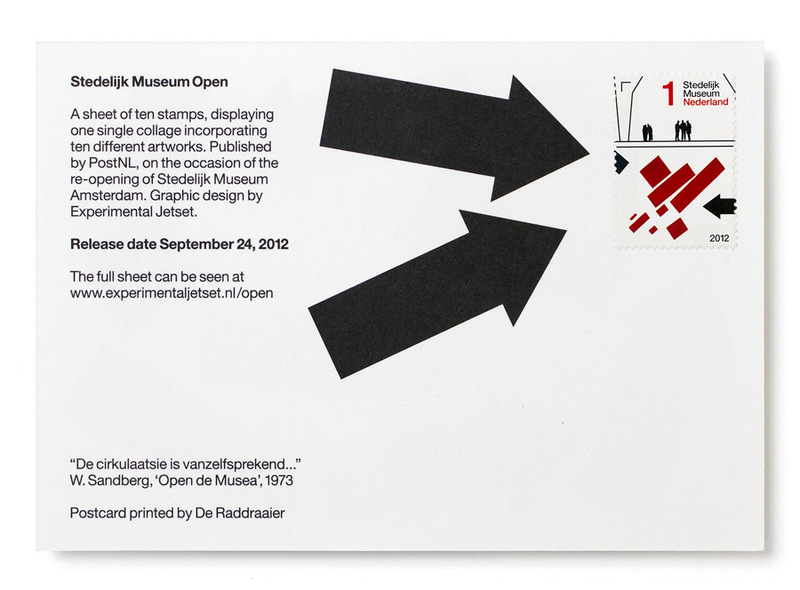 On the other hand, the stamps also had to refer to the (graphic) tradition of the Stedelijk Museum. In other words, in one single sheet, we had to synthesize both the future and the past of the museum. Our starting point was the notion of the building as a timeline. Seen from the side, and reading the structure from left to right, the architecture becomes a depiction of movement through time. The old hall can be seen as a representation of the past, while the new extension symbolizes the present, the narrow end of the roof pointing towards the future. However, reconsidering the idea of the timeline, we quickly realized that the history of art and design could not be represented in such a linear, straightforward manner. Instead of a simple line, we felt that the idea of progress should perhaps be depicted as a slightly more complicated affair – for example as a series of spirals, where the past constantly influences the present, where visions of the future inform the past, and where the past is constantly being reinterpreted through the present. We felt that this notion, of a permanent circulation of time, is something that is very apparent in the history of modern art, and in modernism in general. To quote the French philosopher Régis Debray (from his great essay ‘Socialism and Print’, 2007): “The greatest modernizers inaugurate their career with a backward leap, and a renaissance proceeds through a return to the past, a recycling, and hence a revolution. [...] Behind the ‘re’ of reformation, republic or revolution, there is a hand flicking through the pages of a book, from the end back to the beginning. Whereas the finger that pushes a button, fast-forwarding a tape or disc, will never pose a danger to the establishment”. So our idea was to show, within the walls of the new extension, exactly this continuous circulation of time – this ‘permanent revolution’, so to speak. As it happens, during the research that we undertook as part of the design process, we came across a quote by former Stedelijk Museum director (and designer) Willem Sandberg (1897–1984), who, in some loose notes on the now-demolished ‘New Wing’ (the old Stedelijk extension, in existence from 1954 to 2006), casually mentioned that “the circulation must be self-evident”. This citation (which we incorporated in the sheet) became the motto of the design: “de cirkulaatsie is vanzelfsprekend”. Then, the arrows. Obviously, the arrows are there to emphasize the idea of circulation. We liked the idea of the arrows becoming a sort of miniature ‘museum sign system’, describing an impossible path through the building. In that sense, the arrows also refer to the idea of the ‘dérive’, the concept of the ‘urban drift’, as described by the Situationists decades ago. In fact, in some of these Situationist maps (for example, Guy Debord’s ‘Naked City’ from 1957), arrows play an important role. Also, Sandberg’s notes on his ‘New Wing’ (mentioned above) include several sketches in which arrows appear. So the arrows felt like a fitting choice for this particular sheet of stamps. 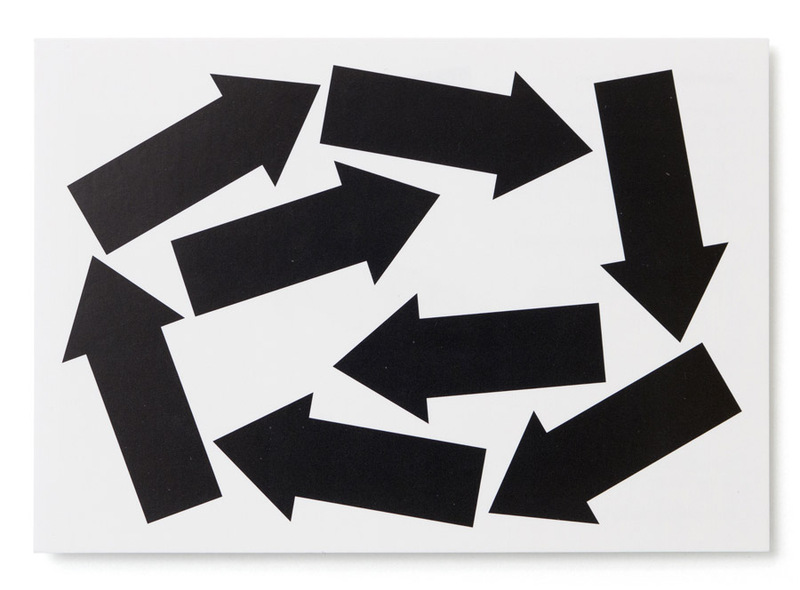 In between these arrows, we placed a selection of images, representing artworks that we personally felt were typical (in one way or another) for Stedelijk Museum. We used these artworks (including pieces of design as well) in a graphic (almost typographical) way: as a typology of primal signs, rather than as a gallery of little paintings. 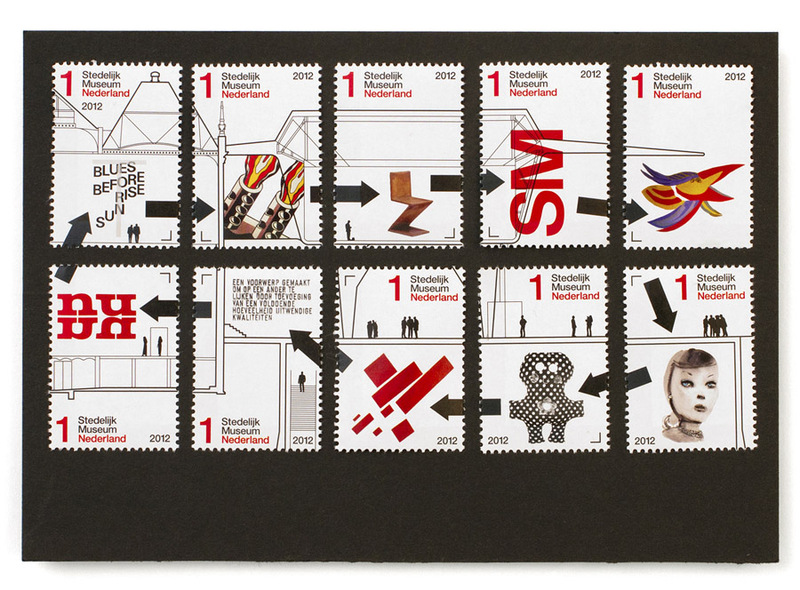 We then combined all these elements (the arrows, the images of the artworks, and an architectural drawing of the museum) into a collage-like composition, filling the entire sheet of stamps. To us, the notion of the ‘architectural collage’ (combing the practical with the impossible) emphasizes the utopian dimension of modern art in general, and of Stedelijk Museum in particular. And, to return to the theme of the circulation of time: it is exactly in these kinds of ‘architectural collages’ (as can be found in the graphic output of architecture studios and collectives such as Archigram, Ant Farm and The Independent Group) that the past, present and future chase each other around the room, speeding up the wheel of progress. To introduce the stamps, we also designed a simple postcard (A6-sized, two-sided, offset-printed by De Raddraaier) which displayed ten arrows (eight on the front, two on the back). Needless to say, the ten arrows on the card referred to the ten arrows on the sheet of stamps. Depicted artworks, clockwise from top left: Mevis & Van Deursen, poster for ‘Blues before Sunrise’ (detail, 2012); Roy Lichtenstein, ‘As I Opened Fire’ (detail 1964); Gerrit Rietveld, ‘Zig Zag Chair’ (first prototype, 1932); Wim Crouwel, logo for Stedelijk Museum (1964); Karel Appel, mural for Stedelijk Museum (detail, 1956); Marlene Dumas, ‘Barbie with Pearl Necklace’ (detail, 1997); Mike Kelley, ‘Empathy Displacement No. 7’ (detail, 1990); Kazimir Malevich, ‘Suprematist Composition: Eight Red Rectangles’ (detail, 1915), Lawrence Weiner, ‘An Object Made’ (detail, 1988); Willem Sandberg, ‘Nu 2’ (detail, 1967). The extension of the Stedelijk Museum has been realized by the architects Benthem Crouwel, in 2012. 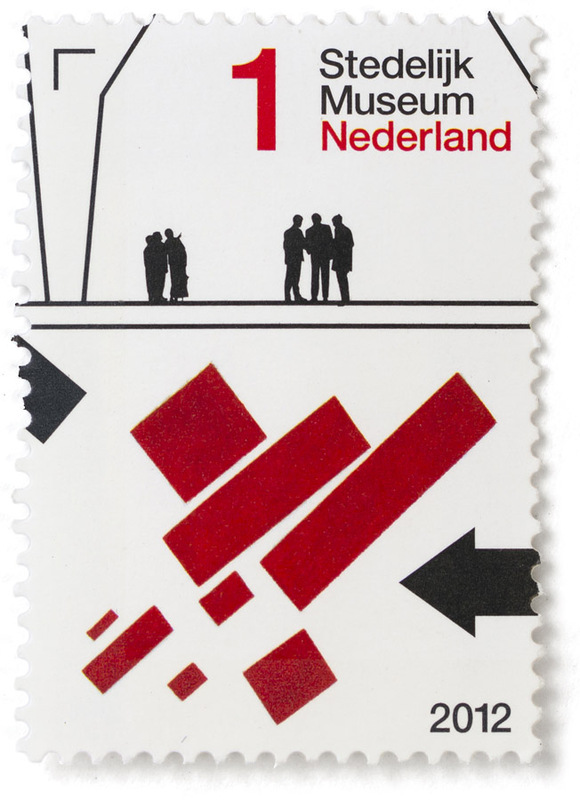 The sheet of stamps can be ordered through the website of PostNL, and is available at national post offices, Bruna kiosks, and at the museum store of Stedelijk Museum. The exact release date was September 24, 2012. (Note: we only designed the actual sheet. The accompanying wrapper and first-day-envelope, which can also be ordered via PostNL, were designed by PostNL).